Be the first to share your favorite memory, photo or story of Damien "Pork Chop". This memorial page is dedicated for family, friends and future generations to celebrate the life of their loved one. 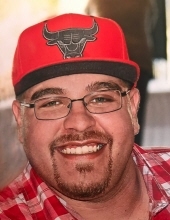 Damien 29 passed away February 8, 2019 at McLaren-Bay following a courageous battle with a medical complication. He was born in Bay City to Michael White & Heather Morin on July 14, 1989. He was very energetic always on the go and enjoyed being with his family especially his children. He loved cooking and his life’s dream was to be a chef as he had started culinary school just before his sickness. He loved gambling of any kind, hunting, fishing, camping, cooking & eating as how his nickname “Pork Chop” came to be. He is survived by his wife Corinna and children Robert, Aizlee and Damien Jr; his father Michael & Rachel White and mother Heather & Butch Thompson; siblings Jade Thompson, Brenden Thompson, Dakota Tanner and Cheyann White; grandparents Linda Morin, Jr & Cindy Diaz, Mary Thompson, Christen Schatzer; great grandfathers Norbert Morin and Papa Williams; mother in law Shannon Basner; brother in laws Tevin Basner and Keaton Griffin; aunts and uncles Lisa & Michael Duso, Jessica & Charles Smithers, Jason & Ann Diaz, Just Diaz, Jake Diaz, Shawen Valeck, Robbie Valeck, Jon Koweta, Rebecca & Frank Hidalgo, Sarah Gobeski and Butch & Yvonne Williams also a very special Corey Lopez.He was preceded in death by his grandparents Ann Marie Yarboro, Nanna and June Morin. Funeral services will be held Thursday February 14, 2019 at 4 pm from Rivertown Funeral Chapel with Mr. Allan Verhagen presiding with cremation to follow. The family will be present at the funeral chapel on Thursday from 11 to 4 pm to greet family and friends. Those wishing an expression of sympathy are asked to consider the family’s care for his children. To send flowers or a remembrance gift to the family of Damien "Pork Chop" M. White, please visit our Tribute Store. "Email Address" would like to share the life celebration of Damien "Pork Chop" M. White. Click on the "link" to go to share a favorite memory or leave a condolence message for the family. memory of Damien "Pork Chop"